“This is a 100-year event,” John Leitao, chief executive officer of De Grisogono, told a news conference at the Grand Palais. The stone, which is more than 2.3 inches wide, will be cut in Antwerp and is expected to produce the world’s largest D Flawless diamond, weighing between 300 carats and 350 carats, said Nickolas Polak, international director of Nemesis. “It’s a stone that generates its own energy,” he commented. 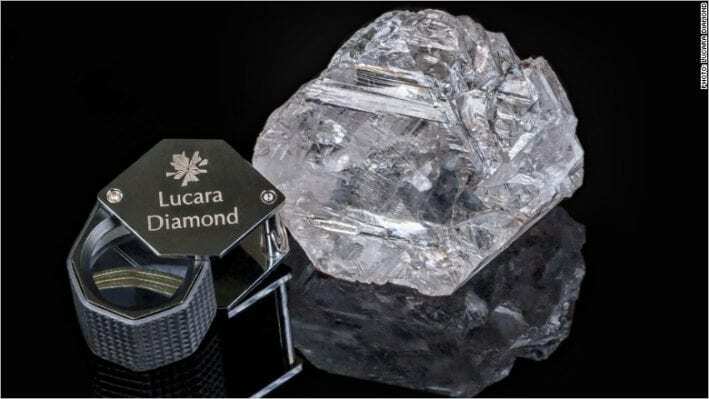 Lucara has discovered a number of sizeable stones at its Karowe site, including the 1,109-carat Lesedi La Rona. That gem failed to sell at an auction held at Sotheby’s in London in June, which was read by the trade as a challenge to the way that large rough stones are usually sold in private deals or tenders to diamond traders. De Grisogono is one of just four jewelers showing at this edition of the Biennale, alongside Nirav Modi, Cindy Chao and Boghossian, after other leading houses pulled out of the event over disagreements with organizers about the space and location devoted to high jewelry firms. Fawaz Gruosi, founder and executive board director of De Grisogono, said he had been unable to sleep as he mulls how to set the Constellation. “It’s difficult to do something around it. You want to just leave the queen alone without interference, but that is not in the De Grisogono style,” he mused. Earlier this year, De Grisogono and Nemesis unveiled another rough diamond, weighing 404 carats, at a party at the Cannes Film Festivalattended by Kim Kardashian, Robert de Niro and Chris Tucker. 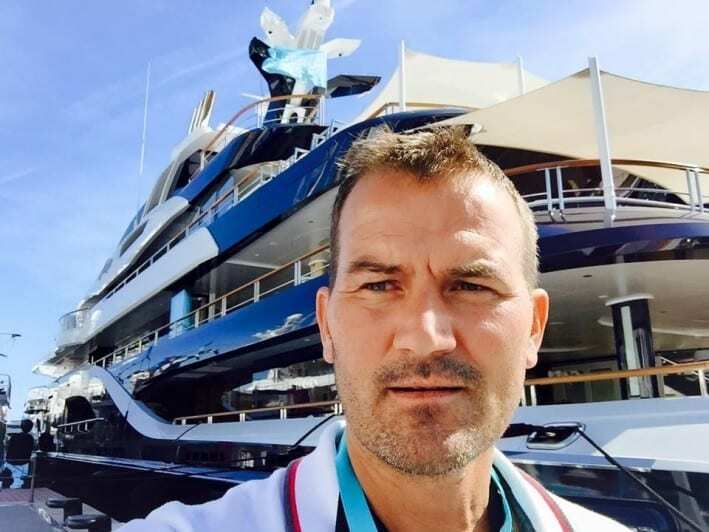 Gruosi on Friday revealed that he was playing with the stone at the De Grisogono suite at the Grand Hyatt Cannes Hôtel Martinez when it was accidentally cleared off the table by a waiter – and later found back in the trash. 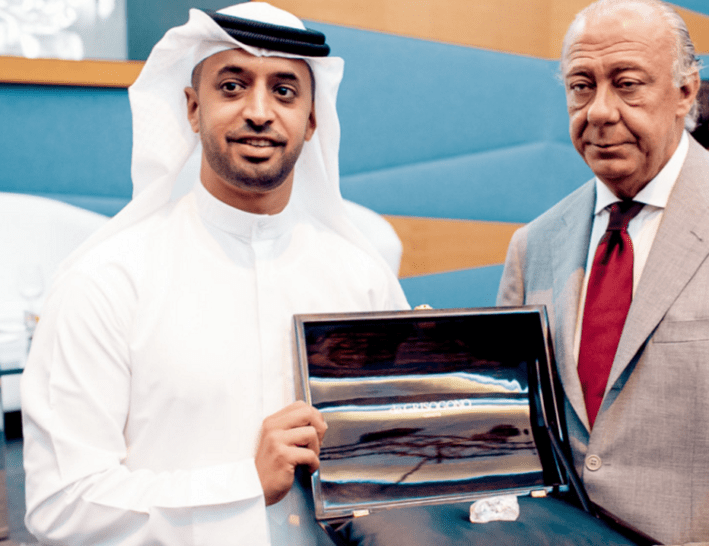 De Grisogono founder and executive board member, Fawaz Gruosi, held a press conference in Dubai to announce the news with executive chairman of DMCC and chair of the Kimberley Process, Ahmed Bin Sulayem. To gain access to the most precious diamonds, de Grisogono has partnered with Nemesis International, a leading rough diamond trading company based at the DMCC, which works on a day to day basis with the best diamond mines in world to identify, select and acquire the most precious diamonds in existence. The latest stone the brand has acquired weighs 404 carats and is said to be one of the 30 largest top quality rough diamonds ever found, and the largest ever founder in Angola. The stone is rare not only for its size but for its colourlessness and flawless clarity. The exceptional size and clarity of this stone will allow de Grisogono a unique opportunity in its cutting and polishing process. Working side by side with the best cutters, Fawaz Gruosi will now decide how best to cut this diamond in order to an impressive piece of jewellery. Contrary to the traditional process, where jewellers are restricted to the polished stones that already exist in the market, with this partnership, de Grisogono will have the opportunity to bring a jeweller’s perspective into the cutting process, maximizing the beauty of the final jewelry pieces. The colourlessness and flawless clarity of this ‘mineral beauty’ makes it the perfect diamond in de Grisogono’s pursuit for the most unique and precious stones. This diamond represents one of the 30 largest top quality rough diamonds ever found, and the largest ever found in Angola. De Grisogono threw a lavish party yesterday on the sidelines of the Cannes Film Festival and showed off a giant 404-carat diamond worth $20 million which the jeweller plans to turn into something very special. The party was held under the theme ‘Folies in Cannes’ at the Hotel du Cap-Eden-Roc at the Cap d’Antibes in France. It attracted a host of stars and A-listers including Kim Kardashian, Milla Jovovich, Bella Hadid, Robert De Niro, Grace Hightower, Paris Hilton, Toni Garn, Amy Jackson, Chanel Iman, Chris Tucker, Kris Jenner, Natasha Poly, Mischa Barton, Gregory Van Der Weil, Hailey Clauson, Valeria Golino and Harvey Weinstein. Following an Elie Saab fashion show, de Grisogono founder Fawaz Gruosi unveiled the 404-carat rough diamond which is said to be the largest found to date in Angola. Luxury jewellery brand de Grisogono has acquired the rights to one the world’s largest and rarest rough diamonds ever discovered. 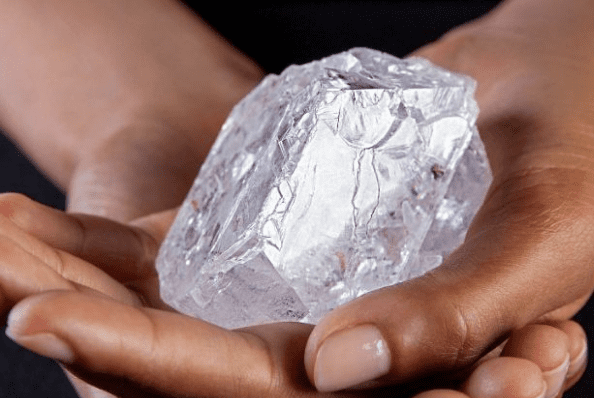 The 404 carat rough is the largest ever founder in Angola.